Hi, I have a 75 gallon reef tank with two clown fish, a coral beauty, and a canary wrasse. I recently added a skunk cleaner shrimp. I have had them before and really like having shrimp in the system. The problem is this shrimp has decided to hang out about an inch underneath the clown fishes' territory. The coral beauty is constantly going near the shrimp to get a cleaning (which the shrimp refuses to do, but that is another issue). The problem is that the clown fish are not happy with the coral beauty being in their territory. Today the larger clown fish fins are torn. I'm worried they will continue to injure each other if the shrimp stays where he is. Is there a way to get the shrimp to move to a different area of the tank? My system is a 500g soft coral and LPS tank with about 20-25 small reef safe fish. I added a cowfish to the mix almost 6 months ago and absolutely love his personality. curiously wondering what they were and then came back to the top of the tank begging for food again. The shrimp were out for a few hrs on the first day and I did not see the cow bother them. They are larger than he is. 1) the shrimps have disappeared after day 1, I have not seen them since (day 3 now), except for one full body molt floating around. Is this normal? I thought they were quite sociable from all the reading I did before. 2) do you think the cow poses a threat to them? they are much larger than he is but that may change in time. have cleaners been kept successfully with cows before? I feed my fish chopped shrimp time to time, should I stop doing this? One final note.... Canary Wrasse, Radiant Wrasse, Christmas Wrasse and Cleaner Shrimp success stories... Do you know of stories where they have all coexisted together? Cleaners in first and the wrasses introduced all at the same time... or just the Cleaners and one type of wrasse??? I guess I must say thank you again and in this case mention that you are levels and levels ahead of local LFS knowledge... hummm maybe that was not as much of a compliment comparing you to my stores :):):) but Thank you very much..
Anyways I have 2 questions, 1st can a skunk cleaner and a Coral Banded Shrimp live peacefully in a 37 gallon FOWLR? (at my LFS I've seen a gold coral banded shrimp and a skunk cleaner live together in a tiny tank, but the gold CBS in that tank was much much smaller than mine.) and my 2nd question is whether a Bi-Color Blenny and Diamond Goby can peacefully in that same 37 gallon? 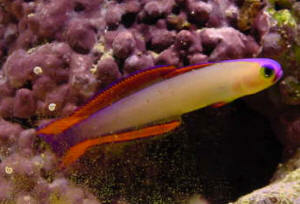 <Your size tank will not support a Diamond Goby long term. The Diamond Goby requires a larger system (50+ gallons) with an active live sand bed to supplement prepared offerings of food. You may want to read the FAQ's here on Valenciennea/Sleeper, Sifter Goby systems. Quick question for you guys/gals. In a 100 gallon tank can Puffers of any variety (tank size appropriate of course) be kept in the same tank with a Skunk Cleaner Shrimp with out fear of it being eaten? Maybe if it has plenty of crabs and snails that it could eat it would be ok? Puffers are my great love however I worry that my Cleaner Shrimp will meet his end. Your thoughts are trusted and respected greatly. Hi, I've been reading your site for awhile now and I'm fascinated by all the information. I browsed through and searched but couldn't find the answer to my query. I came home from work yesterday to find my brown serpent starfish eating one of my cleaner shrimp. The shrimp was still alive and I tried to stop it but it wrapped it up in its arms and almost inhaled it. I have a 38 gallon tank with a 3" regal tang and a 3" Foxface fish. I'm already working on a bigger tank for these 2 as I know they will outgrow this tank quickly. this shrimp was already sick or dying and the starfish took advantage or should I be worried about my other shrimp and crabs at this point? My P.H. is 8.3, Ammonia 0, Nitrite 0, Nitrate 0. Should I start target feeding the starfish or take him back to the LFS? I've been reading several of your articles and cannot quite get my answer. I used to also have 2 cleaner shrimps. For a long time they kept reproducing and my soft corals looked great. Then one disappeared, then a month later the other. No dead bodies- I searched and moved rocks, looked on the floor, just in case. I just bought another cleaner shrimp and he's gone already. I was wondering, since my current fish have grown, could their diet change to include shrimps? I didn't realize how large my fish have gotten over the years, and how small fish and shrimps are at the store. The tangs and Flame Angel used to be 'cleaned' here and there, and no fish showed aggression towards then (that I know of). I really liked my shrimps feeding the corals. Also, this time, a yellow tailed damsel is tending to eggs. The shrimp did wonder <wander> close to her, and I shooed it away. The damsel kept picking at it. I don't know if this was the problem this time. or do I need to add a special food to feed them? I have DT's and phytoplankton, and my LFS now carries copepods. Or is it even worth trying to raise fry. Thanks for any info, especially about the cleaners. I enjoyed having my ams <arms> cleaned, and them getting in my way every time I cleaned the glass and rocks.. I would like to replace them. <Do read/learn more about cleaner shrimp here, Robin. In future queries, please capitalize names of fish, saves me much time if I do not have to do it for you. Thank you Josh. So far, the other shrimp has not been attacked, but it has not ventured out of it's cave as of yet. I'll monitor them closely and try to intervene if and when anything happens again. Luckily we have two tanks to do some relocation when and if necessary. <Excellent, that is good news. I was wondering if it was unusual for a lemon peel angel to kill a cleaner shrimp? My wife and I had just observed one of our cleaner shrimp with a clutch of eggs when our recently added lemon peel attacked it by eating its' eyes off, then returning later nonchalantly and eating the eggs. It was very disappointing watching this as we were happy to see our cleaners were doing so good. The lemon peel has been vigorously grazing on all the LR algae growth in the last three days since he was introduced and has ignored the daily feedings of frozen mysis and copepods. We are afraid he's going to do the same to the remaining cleaner which is in hiding right now as it has just molted. Was this killing done to feed on the eggs only? Sudden N. decora death 3/7/07 Dear WWM Crew, <Hello Brandon today.> As always, thanks for all of your help along the way. <Thank you for your kind words.> We have a 72G reef tank with about 80 lbs. of LR. Our water parameters are (Temp=77deg F, Sg=1.025, pH=8.3, Ca=380ppm, Mg=1290ppm, dKH=6.75, Ammonia & Nitrite=0ppm, NO3= 5ppm). The tank was set up and cycled last May. <Cool.> For about the last six months our live stock has consisted of a pair of clowns (A. ocellaris), a purple firefish (N. decora), a fat mandarin (S. splendidus), and a school of 9 Chromis viridis. Various corals, a tube worm (Protula magnifica) 2 turbo snails and some blue legged hermit crabs. In addition to this we have 3 peppermint shrimp (L. wurdemanni) & one big, beautiful fire shrimp (L. debelius). On February 17th, 2007 we added another fire shrimp (L. debelius) and a pair of cleaner shrimp (L. amboinensis). Everything seemed great for the last two weeks or so, until this last Sunday morning (the 4th). Our purple firefish, which had looked fine & had eaten heartily Saturday night, showed up Sunday morning looking very roughed up. There were two whitish abrasions on its left side, its left swimming fin, dorsal and ventral fins as well as its tail were damaged. <Sounds like fighting. Or a close escape.> It died Sunday night and was subsequently eaten by the fire shrimp. <Mmmm. Sorry to hear that.> This fish had an excellent home inside a small cave (see attached photos) that it had lived in since last August. What could have happened?!?! None of our research, including your excellent site, indicated that any of our shrimp types attacked and ate healthy fish. Could a disease have done this? All of the rest of the fish look fine and are eating well and the corals look great. <It is possible that it and the clowns could have been fighting. More likely than that you could have a predatory creature in your tank that you have not seen. Try feeding the tank after dark, and watching with a flashlight to see what comes out. This is what I would do. I have not heard of a disease that manifests that quickly. There is even a possibility that the shrimp that you have are at fault. There is no such thing as a truly safe shrimp.> We are broken hearted over this loss and need to know, if possible, what killed this sweet little fish (our favorite, actually). Any help would be greatly appreciated. <To be honest, I am not 100% sure. Bob? Mich? Any ideas?> <<Mmm, I do think the Debelius' shrimp was involved here. RMF>> Thanks so much! Cleaner Shrimp/Neon Goby Compatibility 6/20/06 Hello, I have <Hello Paul> A question regarding compatibility of cleaner shrimp and neon Goby. My son is new to salt water aquariums. In his tank are a tang, fire fish, neon goby, 2 clown fish, several turbo snails, 2 peppermint shrimp and a cleaner shrimp. About a month ago, the peppermint shrimp ate the neon goby (yes, my wife saw it in it's mouth). We got rid of the peppermint shrimp and bought another neon goby. Now my son is worried the cleaner shrimp is going to eat the neon goby. Should he be worried? I don't think the shrimp were under fed but they were voracious eaters. <None of the shrimp you have are known to attack/eat live fish. I'm guessing the Neon Goby was already a goner. In that case, the shrimp(s) will scavenge/eat dead fish.> Thanks for your help. <You're welcome. James (Salty Dog)> Regards, Paul M.